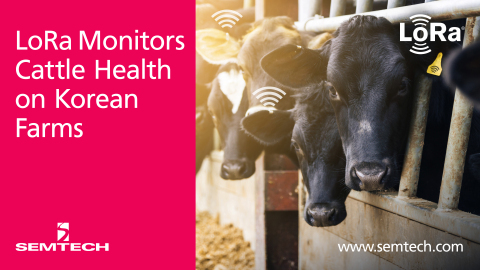 Semtech Corporation (Nasdaq: SMTC), a leading supplier of high performance analog and mixed-signal semiconductors and advanced algorithms, announced that SK Telecom, one of South Korea’s largest telecommunication providers, has created an Internet of Things (IoT) cattle healthcare solution leveraging Semtech’s LoRa® devices and wireless radio frequency technology (LoRa Technology). The product, LiveCare, is a LoRa-equipped bio-capsule which is implanted into a cow’s gastrointestinal tract and monitors for a variety of health indicators. SK Telecom is Korea’s largest telecommunications company with more than 29 million mobile subscribers, which accounts for around 50 percent of the total market. Armed with unmatched competitiveness in mobile connectivity, SK Telecom is actively developing powerful platforms (Lifestyle Enhancement Platform, Media Platform and IoT Platform) aimed at delivering optimal value to customers and sustaining growth in the rapidly changing business environment. For more information, visit: https://www.sktelecom.com/index_en.html. Semtech Corporation is a leading supplier of high performance analog and mixed-signal semiconductors and advanced algorithms for high-end consumer, enterprise computing, communications, and industrial equipment. Products are designed to benefit the engineering community as well as the global community. The Company is dedicated to reducing the impact it, and its products, have on the environment. Internal green programs seek to reduce waste through material and manufacturing control, use of green technology and designing for resource reduction. Publicly traded since 1967, Semtech is listed on the Nasdaq Global Select Market under the symbol SMTC. For more information, visit http://www.semtech.com.